Start your football season right. Let your massive game fever direct you towards rewards on every goal. Seize the opportunity and go score! With every purchase of minimum 500 that you make using your ICICI Bank Debit Card, you score one goal. 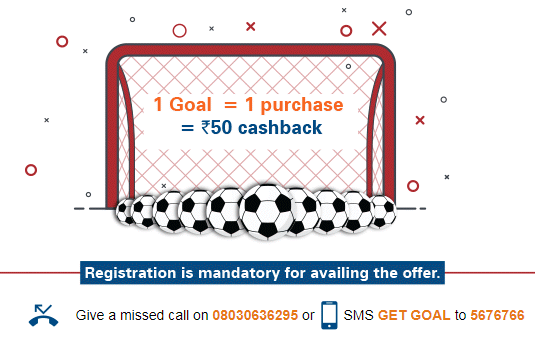 For every goal you score, you earn 50 cashback. Only purchases done at merchant outlets and online purchases will qualify for this offer. Card Holder/s" shall mean such select set of saving / current account debit cardholder who has received the communication of the Program from ICICI Bank with respect to the Program by way of an e-mailer/ SMS/notification or any other mode as per the discretion of ICICI Bank. of minimum Rs.500 each done using ICICI Bank Debit Card during the Offer Period. c. For every goal you score, you earn Rs.50 cashback. e. Registration is mandatory to avail the Offer. Registration details, mentioned above. f. Offer Period: June 14th to July 15th, 2018. “Free kick” shall mean for 1 goal scored by customer i.e. 1 purchase of minimum Rs.500 done using ICICI Bank Debit Card, customer will get cashback worth of 2 goals. using ICICI Bank Debit Card, customer get Rs.50 cashback. If the customer is eligible for a free kick, then in this case, if the customer score 1 goal on that day, then in this case, customer will be eligible for cashback worth of 2 goals i.e. Rs.100 cashback. Free kick offer will be valid only on 7th July, 2018 and only first 3000 purchases done by first 3000 cardholders will be eligible for a Free kick. “Retail Purchase” shall mean such purchase, which has been made by the Debit Card Holder/s by swiping the Card on any bank’s electronic data capture terminal or entering card details for making payments at online merchant payment gateway during the Offer Period. Cash withdrawals on ATMs, reversed or cancelled transactions, wallet transactions will not be an eligible transaction for the program. Any transaction using Debit Cards on merchant category code 6540 (Wallet transactions) will not qualify for the Offer. Upon the Card Holder/s fulfilling the Offer requisites, as per the Offer Terms and Conditions, the cashback amount will be credited to the customer account linked to Debit Card within 60 working days of the end of the Offer Period. Will I get cash back ?? Nope.. “Retail Purchase” shall mean such purchase, which has been made by the Debit Card Holder/s by swiping the Card on any bank’s electronic data capture terminal or entering card details for making payments at online merchant payment gateway during the Offer Period. Cash withdrawals on ATMs, reversed or cancelled transactions, wallet transactions will not be an eligible transaction for the program. Online merchant gateway eligible na ?? im not sure about it.. if you want you can give it a try..
All the best.. hope you receive cashback..
Phonepe is valid, don’t worry. Phonepe doesn’t come under wallet under their system. User specific offer like all previous ones. Did not get cashback for any of them, even after registering. On complaining, they asked for snapshot of emailer/sms. Not expected from a senior dimer having 400+ FPDs! You have posted eligibility terms from two sections, that means you have gone through the PDF document. Then why not share the most important eligibility term – “select set of saving / current account debit cardholder who has received the communication”. Why leave it to someone other to point it out in comments, and cause unnecessary trouble to many dimers? Request you to please add this eligibility term to OP and wiki. Bro almost all ICICI offers are like that only… Still some offers work for all but some won’t work… Moreover, I didn’t read complete pdf, just read few terms which I want to highlight… That’s it..
With every purchase of minimum Rs. 500 that you make using your ICICI Bank Debit Card, you score one goal. For every goal you score, you earn Rs. 50 cashback. Sorry for late post but I too got mail just 6-7 hours ago on my registered mail id. Looks like we will need to register first. I gave a miss call to this number (08030636295) and got sms that I am registered. I too didn’t get any mail or message but got frequent app notifications about this offer for iMobile app, I am also confused whether this offer is for selected customers who receive communication from icici or it is defaultly applicable for all icici debit cards users? But bro , still then it is a doubt only and not confirmed. Also if we spend 5000 in 1 go using icici debit card, will it be equalent to 10 goals I.e 500 cash back or not or do we need 10 separate transactions worth minimum of 500 each to receive 50 Rs cash back separately for each such transaction worth of 500 Rs as part of this offer? One transaction will give you one goal (50 rs cashback). 1. The Offer is valid for select Debit Card Holder/s only who have completed Offer registration within Offer Period. 2. Cash Back shall be applicable only for those who have registered for the Offer and made a made at least one Retail Purchases and met the offer criteria using ICICI Bank Debit Card within Offer Period. 3. Upon the Card Holder/s fulfilling the Offer requisites, as per the Offer Terms and Conditions, the cashback amount will be credited to the customer account linked to Debit Card within 60 working days of the end of the Offer Period. 4. A Cardholder will be entitled to maximum cashback of Rs.500 on total 10 purchases (at merchant outlet or online purchases) of minimum Rs.500 each done using ICICI Bank Debit Card during the Offer Period. 5. The Offer is applicable for the Primary Card Holder/s only and not valid for void transactions. 6. The Offer is not valid with reversed or cancelled transactions, ATM cash withdrawals and wallet transactions. 7. The net purchase value to qualify for the Offer, should be minimum Rs. 500 per transaction. The net transaction value is, total value of purchase, less any cancellation or reversals. 8. Acceptance of the cashback by the Debit Card Holder/s constitutes permission for ICICI Bank and its Affiliates to use the Debit Card Holder/s name, photograph, other details which are furnished to ICICI Bank, voice and comments for advertising and promotional purposes in any medium without being liable to pay any additional charges to the Debit Card Holder/s. 9. No queries will be entertained 90 days after the closure date of the Offer. 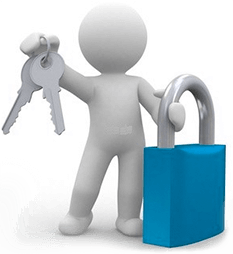 communication of the Program from ICICI Bank with respect to the Program by way of an e-mailer3/SMS/notification or any other mode as per the discretion of ICICI Bank. 10. Any transaction using Debit Cards on merchant category code 6540 (Wallet transactions) will not qualify for the Offer. If i add 500 to phonepe or any other wallet.. is it eligible? Does it work for ICICI pockets ?